^ 存档副本 (PDF). [2014-01-24]. （原始内容 (PDF)存档于2008-07-08）. ^ Mallory (1989:185). "The Kurgan solution is attractive and has been accepted by many archaeologists and linguists, in part or total. It is the solution one encounters in the Encyclopaedia Britannica and the Grand Dictionnaire Encyclopédique Larousse." ^ Strazny (2000:163). "The single most popular proposal is the Pontic steppes (see the Kurgan hypothesis)..."
^ Gimbutas (1985) page 190. 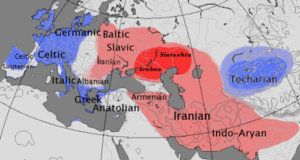 ^ Manoukian, Jean-Grégoire (2006), "A Synthesis of Haplogroup R2 - 2006." ^ Hammer, M.F. ; Zegura, S.L. The human Y chromosome haplogroup tree: Nomenclature and phylogeography of its major divisions. Annual Review of Anthropology. 2002, 31: 303–321. doi:10.1146/annurev.anthro.31.040402.085413. ^ Roper, L. David. 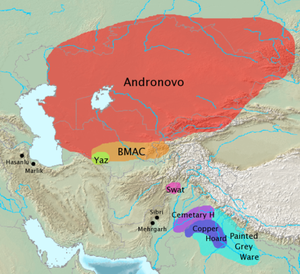 Y-Chromosome Biallelic Haplogroups. L. David Roper. [2013-08-31].